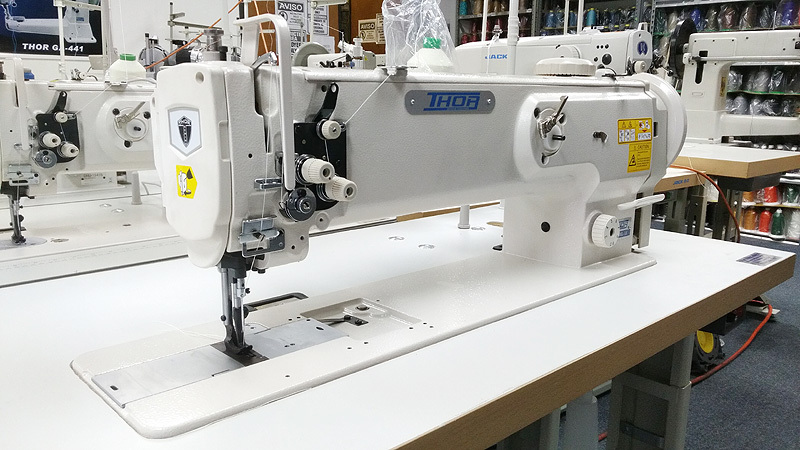 THOR GC-1508L-18 Single Needle 18" Long Arm Walking Foot Sewing Machine for Leather, Vinyl, Upholstery, and Canvas Fabrics. Suitable for sewing such products as cargo handling belts, containers, automobile upholstery, covers, sails, tents, camping trailer covers, awnings, hand bags, etc. Widely used for FURNITURE UPHOLSTERY as well as Automotive, Marine and Aviation Upholstery. The 1508L-18 maximum stitch length of 9 millimeters allows a broader range of uses, such as awnings and tarps. The 1508L-18 has a unique feature which allows the user to simply dial in the walk height of the Walking Foot. This prevents the Walking Foot from snagging on thicker material.